Mr. President, Madam High Commissioner/Deputy High Commissioner, Members of the Council and Delegates to the 40th Session of HRC, ladies and gentlemen, I am pleased to be at the 40th Session of the HRC to share Sri Lanka’s significant progress on human rights since the last review in 2017. I am joined by my parliamentary colleague Hon. (Dr) Sarath Amunugama, the Governor of the Northern Province Hon. (Dr) Suren Raghavan, senior Government officials including Foreign Secretary Ravinatha Aryasinha and Deputy Solicitor General Nerin Pulle, and Permanent Representative Ambassador A.L.A. Azeez. Madam High Commissioner, at the outset we thank you for the acknowledgement throughout your report of the open, constructive and cooperative approach adopted by the Government of Sri Lanka, towards all stakeholders, both within and outside the country, and with the processes and mechanisms of this Council. Our intention has been to engage comprehensively so that our deep-rooted commitment to achieving reconciliation is made evident. 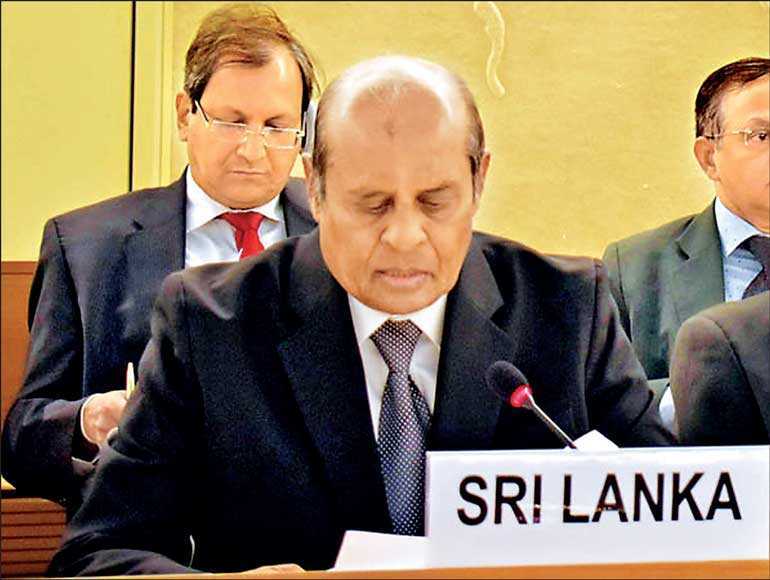 Sri Lanka remains committed to achieving reconciliation and has made steady progress in pursuit of that objective. We have reported to this Council at consecutive sessions on the substantial progress made among others, with regard to civil and political rights, including advances with respect to freedom of expression and assembly, civil society consultation, establishment of a robust right to information framework, the strengthening of independent commissions, including the Human Rights Commission, among others. In the area of Truth Seeking, an Office of Missing Persons (OMP) has been established by law and fully operationalised. The Cabinet of Ministers is currently considering draft legislation to establish a Truth and Reconciliation Commission. In the area of Justice review of cases under the PTA have taken place and trials under the PTA have been expedited, while consultations are ongoing in Parliament to replace the PTA with proposed legislation for Counter Terrorism (CTA) ensuring its conformity to international standards and best practices. All these mechanisms and processes have been put in place within a short span. During this period, the Secretariat for Coordinating the Reconciliation Process and the Task Force also undertook a wide-ranging consultation process prior to operationalising measures. You would agree Madam High Commissioner that such a consultative approach was essential in order to ensure transparency and ownership of these mechanisms by the people of Sri Lanka. With regard to paragraph 17, contrary to the view that the Government of Sri Lanka has lagged in the actual implementation of the commitments beyond the establishment of coordinating bodies, it must be noted that the OMP has been fully operationalised and the Office for Reparations Act passed by Parliament has provided for the establishment of an Office for Reparations in terms of the said law. These institutions are empowered to examine, ascertain, acknowledge and address complaints made to the same, and perform its statutory duties in accordance with a process of fairness and rules of natural justice. Funding for the Office for Reparations has been allocated in the 2019 National Budget. With reference to paragraph 23 of the Report with regard to the discovery of human skeletal remains in Mannar on 29 May 2018, this matter is a case in point for the need to exercise caution in approaching issues of this nature. Contrary to pre-conceived notions, it was scientifically established that the recovered skeletal remains had no nexus to the conflict. Having been facilitated through the Office of Missing Persons (OMP), the test results obtained from a USA laboratory have revealed that the said skeletal remains date back to 1499-1719 AD – a period when Sri Lanka was largely under European colonial rule. This is yet another instance that demonstrates that allegations and mere collection of data should not be pre-judged to cast unjustified aspersions. It also amply demonstrates the need for allegations to always be subject to the due process of investigation in accordance with established legal procedures and not be hastily credited to support unfounded assumptions. With reference to paragraph 25 of the Report, the amendments suggested by the Supreme Court to the content of the Bill on the “Office for Reparations” complies with the basic structure of our Constitution that recognises a functional separation of powers pertaining to organs of government. The incorporation of amendments suggested by the Supreme Court, considered by the Parliament to make amendments to the Reparation Law, is a mandatory process that ensures the constitutionality of the said law. Furthermore, contrary to your observation, it may be noted that the proposed amendments suggested by the Supreme Court broadens its applicability to persons who could seek redress before the Office for Reparations, since complaints that can be received and considered, both individually and collectively by the Office, would no longer be limited to alleged violations of human rights or International Humanitarian Law, but would inter alia in terms of the definition provided in section 27 of the Act, include – persons who have suffered damage as a result of loss of life or damage to their person or property – such damage being in the nature of prolonged and grave damage suffered by individuals groups or communities of people of Sri Lanka. Madam High Commissioner, at a time the world is confronted with increasing acts of terrorism and violent extremism, as I stated before this Council last year, the action by the Sri Lankan security forces during the conflict was against a group designated as a terrorist organisation by many countries, and not against any community. The modus operandi of this terrorist group, which for the first time in recent history deliberately targeted civilians, have now been adopted by terrorist groups all over the world. All communities in Sri Lanka were united against terrorism, and now that terrorism has been defeated, all communities are working in unison towards reconciliation and economic progress. Hence, in the context of paragraph 27 and 29, with reference to criminal accountability, it must be re-stated that Sri Lanka guarantees to all its citizens their rights in accordance with the constitutional and judicial process of Sri Lanka. However, the reference in the said paragraph to the abundant evidence that the ordinary criminal justice system is unable to deal with the nature of the allegations, and the complexity of the crimes is misconceived. On the contrary, the judicial system in Sri Lanka is adequately equipped to deal with complex crimes. Criminal investigations pertaining to cases referred have been taken cognisance of by the investigating agencies to be conducted under established legal procedures and are periodically being monitored in terms of the judicial process. Any complex criminal investigation is time consuming. The acknowledgement in paragraph 20 of the report that ‘victim tracing procedures’ require thorough assessments in multiple areas and takes time, is an indicator that establishes the said assertion. It also negates the alleged inability of the Sri Lankan criminal justice system to deal with the nature of allegations and complexity of crimes. There has been persistent and repeated reference in official documents of the OHCHR and this Council to exaggerated numbers as the alleged death toll during the last stages of the conflict. These assertions remain in direct contradiction to independent assessments sent by foreign missions, UN agencies as well as other international organisations, including the ICRC – and some heavily redacted accounts of which have been presented not only in the House of Lords in the UK on 12 October 2017, citing dispatches by the UK Defence Attaché in Colombo during the last stages of the conflict, but also in writings by academics and journalists which is found in the public domain1. With reference to paragraph 31, it must be noted that constitutional reform is a continuing process conducted in accordance with the procedures of Parliament, which has moved forward unimpeded notwithstanding other political developments in the country. This process requires addressing all issues relevant to the diverse populace of Sri Lanka and is necessarily embarked upon taking cognisance of the concerns of all stakeholders. Madam High Commissioner, with reference to paragraph 32, it may be noted that the draft legislation with regard to the counter terrorism law had inputs from a multiplicity of stakeholders, as well as technical assistance from UN agencies, who were fully engaged in developing the proposed draft to ensure compliance with international norms and best practices. In this exercise, all stakeholders were afforded the opportunity to contest the contents of the proposed Bill before the Supreme Court of Sri Lanka, which was availed of by several parties. Accordingly, the contested sections have received consideration of the Supreme Court and its views on the contents of the Bill are now before the Sectoral Oversight Committee on International Relations in Parliament, where committed discussions have been held, including with civil society. It is also pertinent to note that certain segments of Sri Lanka’s civil society have advocated the repeal of the PTA and non-introduction of any further legislation to deal with terrorism-related issues. These matters that have been placed before the Oversight Committee of Parliament, have resulted in a further prolonged deliberation process in enacting the CTA. As I pointed out in the Sri Lanka Parliament on 14 March 2019, I would like to emphasise that the data reflected in the High Commissioner’s report that only 75% of the land held in 2009 by the security forces has been released is at significant variance with the actual numbers. Of the 71,172.56 acres of State lands held by the Security Forces, since May 2009, 63,257.48 acres have been released, as at 12th March 2019, i.e. a release of 88.87% of land originally held. Of the 28,215.29 acres of the private land held by the Security Forces since May 2009, 26,005.17 acres (92.16%) have been released as at 12 March 2019. I wish to emphasise here that President Maithripala Sirisena’s pledge to complete the release of land and the appointment of a Presidential Task Force on Northern and Eastern Provinces Development through the Gazette Notification (No 2074/11 of 5 June 2018), considerably expedited the process over the past year. This Task Force which meets regularly to monitor and advice on development activities in the two Provinces, includes the Hon. Prime Minister, Cabinet Ministers, Governors of the Northern and Eastern Provinces, Chief Ministers, Chief Secretaries, all Heads of Departments and Members of Parliament representing the Northern and the Eastern Provinces, as well as the Secretaries of the Ministries of Defence, Finance and Foreign Affairs. With regard to the issue of “lack of Infrastructure”, 66,100 houses have been constructed and handed over in the north and east to civilians during the period of 2009 to 2018. In 2019, work commenced, on the construction of 4,750 houses on an “owner driven model”. It is anticipated that this program would be completed by June 2019. The Hon. Prime Minister has taken keen interest to see to the progress of the development in the north and east. On his recommendation a program to construct 10,000 houses has commenced. 2. No of domestic common wells: 1,817 nos. 5. Internal Roads: 254 nos. 7. Hospitals/Health Centres: 56 nos. It must also be noted, Madam High Commissioner, that the Government of Sri Lanka has no policy of “colonisation” of either the Northern Province or Eastern Province, or as a matter of fact, of any province in the country. As regards the contention that land owners are deprived their land by declaring their land as forest cover or as archaeological projects, it must be clearly and categorically stated that the Government has not resorted to any such measures. However, it must be borne in mind that the protection of forest land and archaeological projects is an obligation cast on any State in accordance with its international obligations that mandate protection and preservation of the environment and of cultural heritage. Furthermore, in identifying the relevant forest land and the cultural heritage, respective provincial administrations are also consulted. Madam High Commissioner, in developing these transitional justice mechanisms, Sri Lanka does not believe there is justification for the setting up of an Office of the High Commissioner for Human Rights in Sri Lanka. This said we welcome the benefit extended by the expertise and support of the UN and OHCHR, and in particular technical assistance from the technical advisers of the Special Rapporteur on the promotion of truth, justice, reparation and guarantees of non-recurrence. We also appreciate the understanding shown and the technical and financial assistance offered by other bilateral and multilateral partners. We would also welcome further capacity building, particularly training for judicial, prosecutorial, and investigation officers, in enhancing specialised skills in their respective areas and further improving the functions and credibility of the ongoing local processes.